“Crunchy layers of meringue wrapped in a creamy French chocolate mousse, topped with an irresistible chocolate ganache.”, this is the official description of this unique and tasty cake that you can find in the shop O Melhor Bolo de Chocolate Mundo, i.e. the best chocolate cake in the world in English, which is the name of the shop. You must be wondering if it isn’t a typical case of misleading advertising and this chocolate cake is just another normal cake. No, not this time. Eating a slice of this cake is a culinary experience that any fine pastry lover should have. The layers of the cake have a light texture that melts in the mouth as the taste of chocolate becomes more intense… Curious? You should be. This was my birthday cake for several years because it was hard to find and everyone loves it. Nowadays, it’s easier to find this cake because the owner has established a distribution system that allows authorized pastry shops to resell the cake that continues to be only made in the original store in Campo de Ourique. 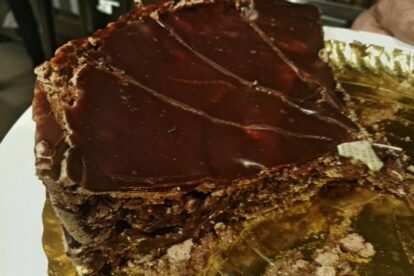 So if you go to Cemitério dos Prazeres, Mercado de Campo de Ourique or even on the mythic journey travel on Tram 28, you must visit the original shop and meet Carlos Braz Lopes and eat a slice (or two) of this cake. You can choose the milk or dark chocolate options, but what is not available is the option to not try!